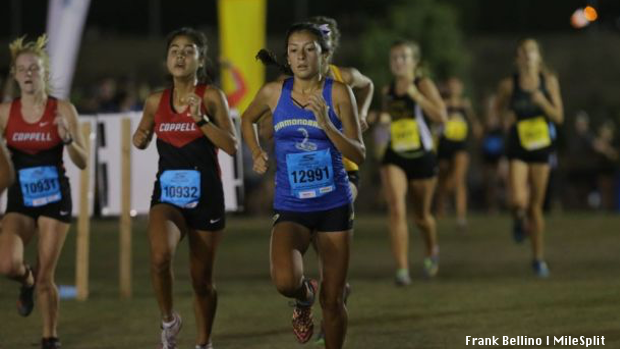 We saw an increased amount of Texas representatives travel to California to compete in the Woodbridge Cross Country Classic, this weekend. 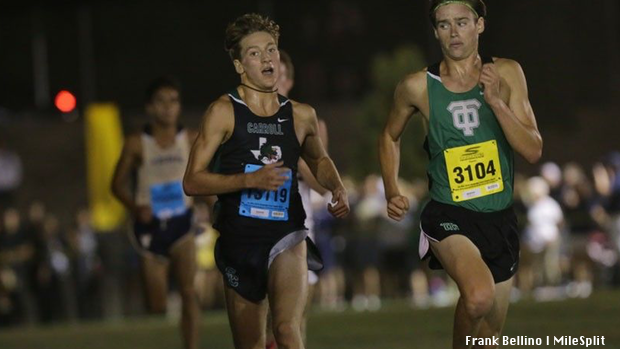 Saturday, deep into the California night, El Paso Eastwood, Southlake Carroll, Coppell, and others raced in one of the biggest cross country invitationals on the west coast, while taking on some of the biggest and best programs in California. On the girls side, we saw Southlake Carroll and Coppell throw down with top national programs like Great Oak, Desert Hills, and Granada. Carroll performed valiantly coming home with a fifth place team finish amongst 23 teams. 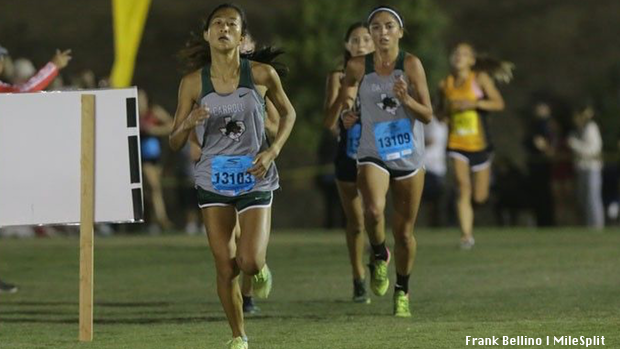 The Lady Dragons dropped a 17:34 3 mile team average running with a 37 second 1-5 split. They were led by junior Lydia Lo and senior Sofia Santamaria who finished in the top two spots for Carroll with their 44 and 45 place finishes just .20 seconds of each other pushing the charge for the lowly 37 split. Carroll's 17:34 3 mile team average approximately equates to a 18:14 5K average, 5:52 1 mile average, and a 3:39 1K average. Coppell also had an eye opening experience in their first trip at Woodbridge. Participating in this fast race could prove to be beneficial in the Lady Cowboys second half of the season. With the regional, state, and NXR South meets looming ahead, Coppell put in a good effort with their 14th place overall finish. They ran a 17:49 team average for the 3 mile race with a 55 second 1-5 split. Junior Shelby Spoor and sophomore Chloe Hassman led Coppell as they finished 49th (17:21.20) and 51st (17:25.60). Coppell's 17:49 3 mile team average approximately equals a 18:29 5K average, 5:57 1 mile average, and a 3:42 1K average. Also tearing it up in California was the Montgomery duo. Their top two runners have proven to be national level elite runners in the past. Last night, they reminded us just how good they are. They were able to take on the top runners on the west coast and they finished in 11th and 12th place. Seniors Halena Rahmaan ran a 16:38.10 and Allison Wilson ran a 16:39.10 to show their fitness is coming along well. 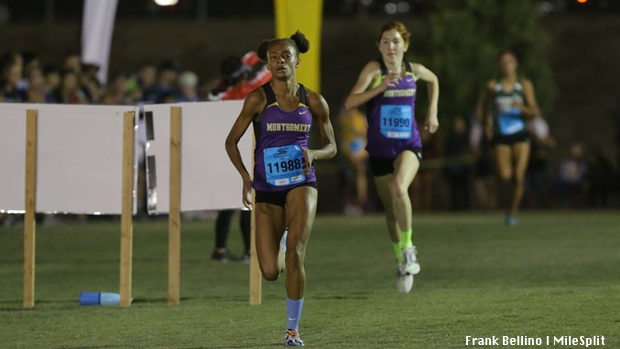 Rahmann has competed at both NXN and Foot Locker Nationals over the last two years has made it known that she plans to at least compete shoot for Foot Locker again. Last season, Wilson qualified for NXN and looks read to compete for a state championship and another national post season run. In the boys Sweepstakes race, we saw the Texas boys flex their muscles. El Paso Eastwood ran a spectacular team race as with their fourth place finish on the boys side. 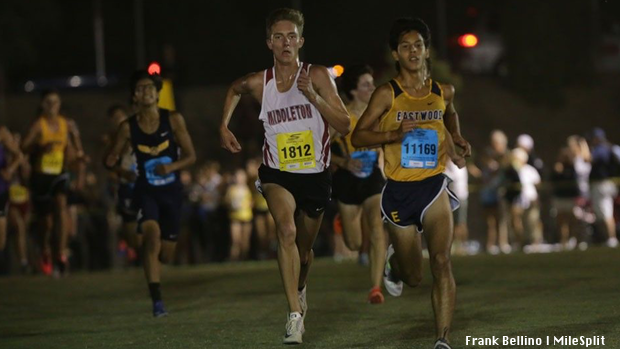 Of the top ten finishing teams, seven of them had sub 15:00 team averages including Eastwood. Of those top ten teams, six of them had sub 1:00 1-5 splits with Eastwood had the second fastest split of 36 seconds. Junior Elias Perez led the way for the El Paso boys with his 24th place finish as he ran a 14:37 3 mile PR. He was joined by Cuatas Sergio and Juan Olmos as they also dipped under 15:00. Eastwood's 14:56 3 mile team average approximately equates to a 15:30 5K average, 4:59 1 mile average, and a 3:06 1K average. Southlake Carroll also ran extremely well. All of the accomplishments that Eastwood had team wise, Carroll did as well as they also finished in the top ten with their 6th place finish. Their 14:58 average and 49 second split put them in the same class with Eastwood showing just how good both Texas squads were. Junior Nate Lannen led all Texans with his 17th place finish in 14:31. He was joined under the 15 minute barrier by Drew Bliss' 14:48 for the Carroll boys squad. Carroll's 14:58 3 mile team average approximately equates to a 15:32 5K average, 5:00 1 mile average, and a 3:06 1K average. Both Eastwood and Carroll have been running well on the season prior to this weekend and have been ranked amongst the top teams in the state. Their performances will no doubt boost their confidence and propel them into the next stage of the season. We congratulate and welcome back home all of the Texans who traveled to California!